Written for the wireless tower industry. According to the Washington County Sheriff’s Office, three men were arrested and accused of breaking into an inactive 150-foot tower last Wednesday. 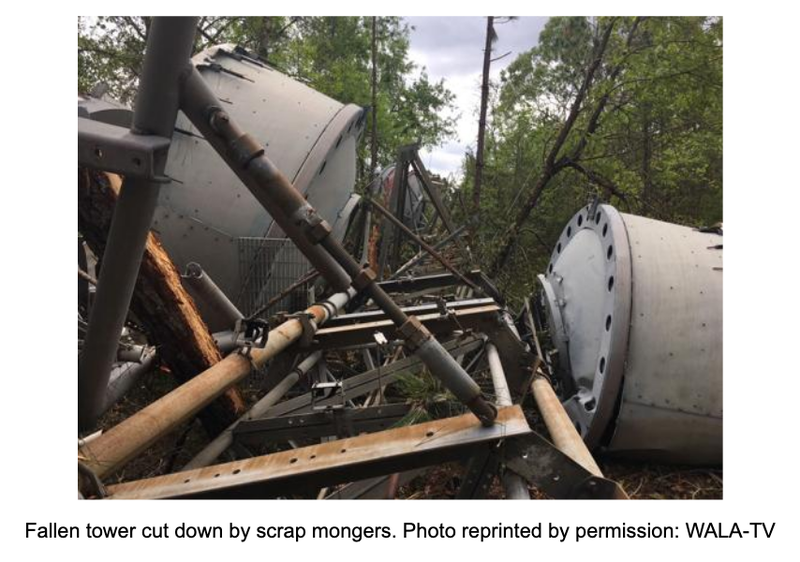 The trio allegedly cut the guy wires, causing the tower to crash into the on-site shed and then returned to the scene on Saturday to steal aluminum, copper and other scrap metal from the site, according to WALA-TV. Lt. Bobby Jeter said it’s one of the stranger cases he’s ever seen. “I got in law enforcement when I got out of the service in ’96. I’ve never seen a cell phone tower cut down before,” he said. We’re so excited that you have found your way to our blog to read all about the latest wireless tower news. Make sure to follow us on Facebook and Twitter and check out our group on LinkedIn, where you can network and discuss topics with other members of the tower industry. If you ever have any tower news, feel free to share it with us at editor@insidetowers.com. Inside Towers is written for the wireless tower industry. There is plenty of news and information for wireless, but there is very little news targeted to towers specifically. There is no other available source of daily tower news and information written for the tower owners, managers, and supporting businesses.